Imagine a long hectic day at the office, with numerous boardroom meetings. By the end of the day, you can hardly feel any sensation in your neck and back. A good heating pad can provide you with soothing relief. They are ideal for relaxing your overworked muscles, and can even provide relief from sore joints and aches. 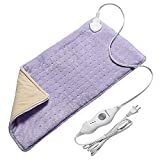 To help you buy the best heating pad, we have scoured the Internet and put together some useful tips that can help you choose a good product. There are three broad categories of heating pads: microwavable, chemical and electric. 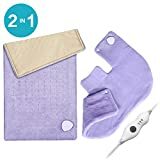 Within these, you will find several sub-types, such as heating pads with both dry and moist heat options. Let’s check out all the options. 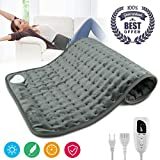 Microwavable Heating Pads: If you are looking for an inexpensive option which can last you months, choose a microwavable heating pad. Made of electrical pads and disposable patches, these act as cooling pillows as well. They are normally filled with a gel, rice or other materials known to retain heat. You can simply put it in a microwave, heat it up to the required temperature, and apply it to the affected region. However, this pad is incapable of retaining heat--you may only get 10 minutes of quick relief. Chemical Heating Pads: Using a chemical heating pad has one disadvantage; it cannot be re-used. They are, however, compact and can be worn directly on the skin. It is best to read the instruction manual carefully, because some of these products need to be worn over clothes. Available in both moist and dry heat mechanisms, the moist patches last for about 2 hours. The patches with dry heat options will last from about 8 to 12 hours. 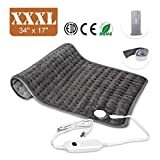 Electrical heating pads are the most compatible with different body types since they come in different sizes: small, medium, large, and extra-large. 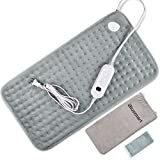 Along with moist and dry heat mechanisms, most of the electrical heating pads have controls that allow the user to regulate the temperature. Most of them also have an auto shut-off feature. Use them with caution, as most of them come with a statutory warning for the users. It is best not to use them while sleeping. 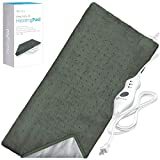 Based on reviews and feedback about different products from consumers, here are a few things that you may consider before buying a new heating pad. 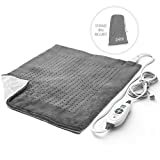 Choose a product based on the heating mechanism: A lesser known fact is that dry heat is more suitable for relaxing the muscles, while moist heat can be quite effective for providing relief from pain. Think about your purpose or the kind of pain you are experiencing, and select the product accordingly. The question of comfort: Choose a product which will provide comfort and relief from pain. Read the features and think whether this will be suitable for you. When it comes to comfort, some fine touches like a soft cover over the product or a cushion-like feel makes the heating pad more comfortable. Also, look for pliable materials which can be effectively used on different parts of the body. Easy to clean: The heating pads are convenient to use if they can be cleaned without any hassle. While some are made to be washed by hand, others can be put in the washing machine as well. It is recommended to use pads with a cover--you can take off the cover and clean it when necessary. Look for a durable product: It is of no use if you make an investment on a particular heating pad and then change it after a month or two. Think of it as a one-time investment from which you will derive benefit for many years. The cost of the product: Select a product according to your budget and requirements. The most expensive ones in the market may not always be suitable for your purposes. Choose judiciously and look for features that will cater to your needs. Look for a warranty: A product without a warranty is not a wise choice. 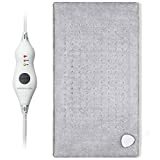 It is always good to opt for a heating pad which comes with a warranty period, so that if the device malfunctions, you can get it repaired or replaced for free. In some cases, the manufacturer might be willing to change it without any extra money. 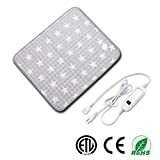 With temperature control: Heating pads with temperature control and multiple heat settings are extremely convenient. The user can monitor the temperature according to what they find most comfortable. Check this feature in your product before making a purchase, as heating pads without this feature can cause a burn. TheraTherm: This is one of the most popular companies of top-selling heating pads. One of their most popular products, the TheraTherm 1032, is extremely comfortable because of its soft material and is ideal for back pains. 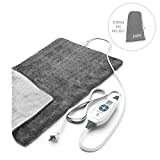 Sunbeam: Initially starting with electric appliances, Sunbeam is one of the leading American brands which are now producing top-rated heating pads as well. The Sunbeam Xpress Microplush is one of the best-known products in the market with an amazing flexible padding which makes it convenient to use on different parts of the body.